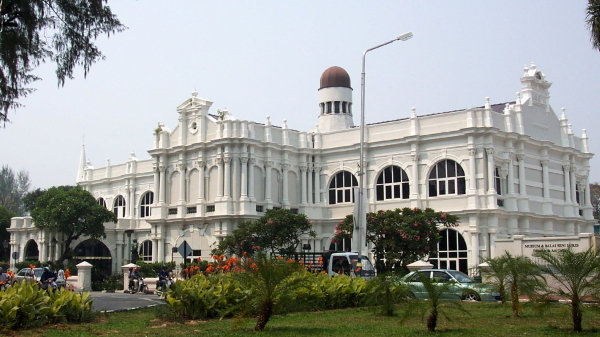 The Penang State Museum is on Jalan Farquhar, more or less behind the state court buildings and not far from the Padang. It's one of the better museums in Malaysia and is worth a visit. If for no other reason, the museum is a cool respite from the hot tropical sun. The museum is housed in an old colonial-era building. Well, half of it anyway. Half was destroyed in World War II bombing. In a courtyard in front of the museum is a statue of Captain Francis Light, although actually it was based on a portrait of his son William, who founded Adelaide. The ground floor of the museum is devoted to displays detailing the rich cultural heritage of Penang's many ethnic groups. The exhibits make generous use of real clothing, furniture and other artifacts from Penang's early years. The second floor of the museum is devoted to a historical perspective of the island, from Captain Light's landing to the problems created by secret Chinese societies and on to the present day. There is also a collection of paintings and prints of old Penang by artists such as Captain Robert Smith. Outside, near the museum's entrance, the museum gift shop is housed in an old carriage from the Penang Hill funicular railway. Admission to the museum costs 1 Ringgit (0.20 USD). The museum is open from 9 am to 5 pm daily except Friday.